Domain Eukarya: members can be single-celled or multicallular. Organisms who cells have a nucleus. kingdom Animalia: they are all multicellular, heterotrphs, no cell wall. Phylum Chordata: members of the phylum have bilateral symmetry, germ layers, digestive system. Order Perissodactyla: There hindfoot had 3. The forefoot has 4 or 4 digits. they have horn on the top of there heads. Family Equidae: Members of the family have 40-42 teeth. they have a lock of hair on there forehead, called the forelock. Height: the tail length is usually 47 to 56 cm. There shoulders is around 110 to 145 cm. Diet: Zebra's mainly eat grass, 90% grass in there diet. They mainly eat herbs, leaves, tigs. Habitat Description: grassy lands and large area's. Predators: lions, spotted hyenas, African wild dogs, cheetahs, leopards, Nile crocodiles. This map shows where zebras naturally range is. zebra strips are usually black and white but sometimes, it gives off a brown "shadow." zebras are the on the only species that are not really threaten. Zebras have high crowned teeth for grinding and chewing on leaves. It helps them chew thick grass and leaves. They have strong feet which help them through a mighty kick. It helps if they are getting attack it is their fighting method. Their bold striped pattern gives zebras an unmistakable appearance. Predators could mistake it for something else and it will leave and not come and hurt zebras. 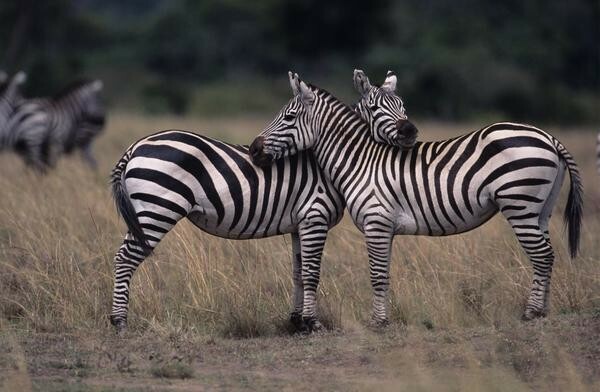 Zebras strips help them stay protected from tsetse flies and other bugs. It helps them because there strips are black and tsetse flies love colored targets. Male zebras are usefully stronger which means they can protect there habitat. The tails of the zebras are short and end with a black spot of hair. This helps them because people can mistake them for something else and leave them alone. Zebras wake up early in the morning to get water before all other mammals. Zebras do not follow a herd system like many other animals. Because individuals can move further distances for food and water, then in a herd. Males keep their territories for long periods of time during their breeding season. Zebras have 5 main ways of communicating to give different signals. They have 2 alarm calls, a quiet gasp, or a loud snort. They also have short squeal, used when greeting and when kicked or bitten. 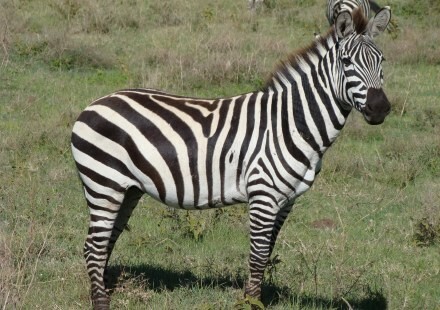 Zebras also have a drawn out squeal when injured. Last blowing with lips, when content. After a female gives birth they act really aggressive towards all other animals including their own to protect their baby's. Zebras have 3 way to move gallop, trot, walk they can walk up to 55 km per hour. This is useful when a predators are around to run away fast. Burton, M., & Burton, R. (2002). zebra. In International wildlife encyclopedia (3rd ed., Vol. 21, pp. 3009-3012). New York, NY: Marshall Cavendish.